For completeness our history will cover papyrus, parchement, vellum and paper and give information on the development and usage of each of these writing materials. Writing on papyrus from Amman. Papyrus is similar in many ways to paper, including being made of plant material and being made into sheets. Papyrus is made from the pith of papyrus plant (Cyperus papyrus), with sheets being made of a layer of flattened strips of pith laid together, each slightly overlapping, and then a second layer laid at right angles to the first. This is then pressed and smoothed to produce the final papyrus sheet. 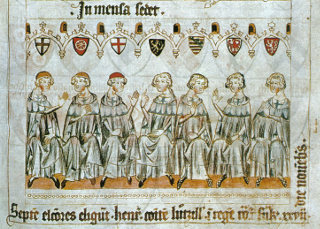 Drawing on parchment from 1341. Parchment, unlike paper and papyrus, is made from stretched and dried animal skins. It is then cut into sheets for use as a writing material. Parchment is usually made from calfskin (vellum), goatskin or sheepskin. The earliest recorded use of parchment is also in Egypt and at about the same time as the earliest use of papyrus. 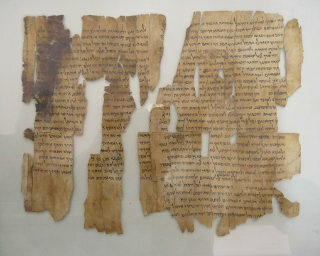 One parchment scroll has been dated to 2550-2450BCE and parchment was fairly common across the middle east by the 6th century BCE. In Europe parchment was widely used between the 6th century CE and the 14th century CE when paper became a more common media. Many important books and documents were written on parchment, including the Magna Carta and the US constitution. Parchment is subject to warping under changes in humidity so that pages are no longer flat. It is for this reason that many old parchment books have heavy covers and are locked tightly shut when not in use. Vellum is a special form of parchment made from calfskin, with the quality of the vellum being linked to the age of the calf. British acts of parliament are still written on vellum for the parliamentary archives. Some paper manufacturers, nowadays, call their top quality writing paper vellum when if fact it is just paper. There is also 'paper vellum' a plasticised cotton paper that is slightly transparent. This is used for blue prints and larger scale architectural plans as it is less subject to shrinkage and can be traced more easily than standard paper. Paper is thought to have originated in China sometime in the 2nd or 3rd century BCE. 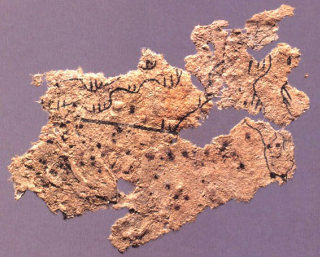 This is due to the dating of a fragment of a map, found in Fangmatan, to the 2nd century BCE, it being the oldest piece of paper found to date. Historical records in China, The Twenty Four Histories, attribute the discovery of paper to Cai Lun in 105CE a somewhat later date. The paper recipe used by Cai Lun included plant bark fibres, rags and fishing nets. Early paper makers particularly valued Mulberry and Sandalwood for producing high quality paper. Later, sometime between the 2nd and 4th centuries CE and insecticidal dye was added to the paper pulp to increase its durability. It was at about this time that paper began its spread across the globe reaching Japan between the 3rd and 6th centuries CE, Pakistan by the 6th century, Samarkand by the 8th century, Egypt by the 9th century and as far west as Morocco by the 11th century. It was from Morocco that paper spread into Europe, via the Iberian penisula, in the 11th century. Over the next three hundred years paper making spread North and East back across Europe. Europeans implemented automated pulping with water mills being used to power hammers to break down the raw materials into pulp. In the 19th century advancements in the paper making process were striking, with the introduction of steam power and the development of wood pulp (separated cellulose fibres). This allowed paper to be made more efficiently and without any dependence on recycled rags, thus vastly increasing production capacity. The 20th and 21st centurys saw further improvements in the paper making process with paper being made acid free, increasing stability and preventing disintigration. Additionally bleaching of paper to make it whiter/brighter has become common and the addition of optical brightening agents (OBAs) to further increase brightness.